Over the years newspapers, magazines, radio talk shows, videos and websites have shared a number of variations of the legend of "Carbine Williams", to include an MGM movie by this name and the book "Carbine, The Story of David Marshall Williams" by Ross E. Beard, Jr. The sources for some of these stories have often been interviews of Williams, his family, neighbors, acquaintances, and/or those who had various reasons, both real and imagined, for liking or disliking the man regardless of realities. Even more stories have been authored using the earlier versions authored by others as their sources. Rather than just quote the work of others, for the purposes of this website the author chose to review the previous stories, then research the claims using currently available resources without any bias one way or the other. Over time with the invention and improvements of computers and the internet, records have been become far more easier to locate and access than ever before. This author's research led to the conclusion that to address "The Legend" and/or the limited work actually done by Williams on the design of the U.S. Carbine alone would be like examining history with one eye closed. Williams was indirectly responsible for one of the key components used in the design and development of the U.S. Carbines. This one component was part of a basic concept developed and used by Williams to design and develop a number of firearms. As with the U.S. Carbine in 1941, over time other inventors have borrowed from this concept to operate the semi-automatic action of their firearm(s). These pages are not the lifelong story of Williams, nor are they a complete accounting of his work. They are meant to address the legend, while at the same time present the designs and inventions of Williams together. When presented chronologically and collectively they provide a basic historical account of the work of Williams that helps understand what he did and didn't do related to the design and development of the U.S. Carbine. Inevitably some people will choose to believe the legend regardless of the facts. One of the more interesting things I've found during my work are the myths of the legend of "Carbine Williams" have actually drawn attention away from his true historical contributions he should receive credit for. The Origin of "Carbine Williams"
"Carbine Williams" was the name of the Metro-Goldwyn-Mayer (MGM) movie that premiered April 24, 1952 at the Colony Theater in Fayetteville, NC. The script and movie were based on the life story of David Marshall Williams of Godwin, NC, as told by Williams himself. The story follows his life as an incorrigible youth eventually sentenced to prison for the murder of a law enforcement officer during a raid on his still. During his time in prison he gained the trust of the warden, who allowed him to pursue his interest in firearms design and development that included building a number of firearms while incarcerated. His efforts led to a pardon and his release from prison, after which he continued with his firearms design and development eventually leading to his employment by Winchester Repeating Rifles and his design and development of the U.S. M1 Carbine. The same carbine manufactured in the millions and used by American troops during WWII and the Korean War. Interest in the movie had gained a tremendous boost when MGM announced the actor playing the part of David Marshall Williams would be James "Jimmy" Stewart. By then Stewart had established himself as a major Hollywood icon. With a strong supporting cast that included Jean Hagen (Mrs. Williams) and Wendell Corey (the Warden), the attention the film received was in keeping the iconic status of it's key actors. When it became known the film's premier would be held in Fayetteville and attended by the movie producer, director, the stars and cast along with other celebrities, the day of the premier was announced as "Carbine Williams Day". No doubt some of this was initiated by MGM's marketing personnel but it could not have happened without the assistance and support of the City of Fayetteville, Cumberland County, and to a lesser extent the State of North Carolina. The premier was preceded by a parade, ceremonies, autographs and lots of media attention. The parade and ceremonies included Generals Douglas Mac Arthur and Lucius Clay, WWII Medal of Honor winner Audie Murphy (whose acting career had started in 1948), Governor Cherry of North Carolina, and other dignitaries. After the premier, Williams traveled the country appearing where the film was shown, offering autographs and photographs. By the time David Marshall Williams returned to Godwin, NC, he was known as "Carbine Williams" and personally adopted the moniker. To include having it painted on the side of his convertible Cadillac. Movie and television producer/director Michael Mann once told me movies are not about truth or reality, they're intended as entertainment to help people escape their own daily realities. Movies of truth and reality are called documentaries and do not attract the crowds or make the money that entertainment does. A truthful and realistic perspective from a man who has been fairly successful in the entertainment industry. When a movie and/or it's advertisements contain the words "Based on a True Story", what this means is the true story was the baseline on which the fictional movie was built. The story presented in the movie "Carbine Williams" was entertainment based on the story as told to MGM's producers by David Marshall Williams. Verbally, in writing, and as a technical consultant during the production of the movie. The movie's script is maintained in the MGM Collection by The Academy of Motion Pictures Arts and Science, Special Collections, Margaret Herrick Library, Beverly Hills, California (Turner/MGM Scripts; Ref: 495503.f-C-306.f-330) and consists of two documents. "The Williams Story" by David Marshall Williams (copyrighted by Williams February 9, 1951 - Copyright AA0000174857). "Army Carbine: The Rifle that was Born in Prison" by David Marshall Williams "as told to B. Fay Ridenour". The "script" is not the actual lines of the actors, it's an overview of the story. A cover page indicates the script was prepared by a member of the MGM script department March 15, 1951. The library does not allow the script to be copied or photographed. The movie and it's script are an active copyright now owned by Warner Home Video, a division of Time Warner Entertainment Company (Document Number V3422D754). B. Fay Ridenour was a newspaper reporter for the Charlotte Observer. 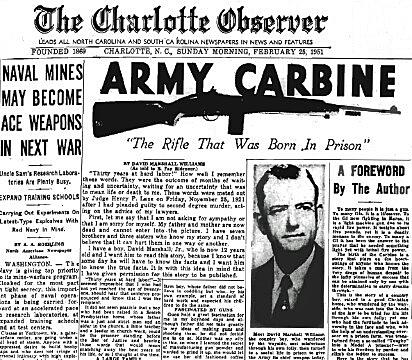 The original story of the "Army Carbine: The Rifle that was Born in Prison", as authored by Williams and told by Ridenour was published prior to the creation of the movie script, by the Charlotte Observer on February 25, 1951. The article includes an introduction by Ridenour declaring the article to be a correct accounting of events. Within the article Williams is quoted: "In 1939 I went to work for Winchester and it was while working for them that I invented the U.S. Army Carbine that is in use today". The document copyrighted as "The Williams Story" may have been authored for the specific purpose of inclusion in the movie script. While it can be argued "The Williams Story" was intended as a work of fiction, the "Army Carbine: The Rifle that was Born in Prison" and it's introduction by Ridenour published by the Charlotte Observer clearly present the story as factual and as told by Williams. Over the years Williams also made the claim of having invented the M1 Carbine during interviews with a number of authors and periodical editors. Mention needs to be made of the article "The Most Unforgettable Character I've Ever Met", by Capt. H.T. Peoples (Former Superintendent, Caledonia State Prison Camp, N.C.), Reader's Digest, March 1951. From the article: "With the Winchester staff of gun designers, he produced the pilot model of the carbine in just 13 days! Royalties soon began coming in on the carbine, and Williams was on his way to fame - and considerable wealth." This is a good example of a variation of the legend. Williams himself indicated he had originally negotiated with Winchester for royalties on any of his inventions but did not receive royalties from the development of the M1 Carbine, he was paid with a lump sum payment. This is supported by other documentation covered within the pages of the links indicated below. Captain Peoples also indicated Williams had been pardoned. A warden would know the difference between a pardon and a sentence commutation, as do the majority of prison inmates. Why Peoples would indicate Williams was pardoned when it wasn't the case is not known. Again, this article is a good example of variations of the legend. The sentence commutation versus pardon is detailed further on the pages of the links below. No one person can take credit for having designed, developed, and/or invented the U.S. Caliber .30 Carbine, Model M1. It was a team effort to produce two prototypes with the second prototype being the one chosen by the Ordnance Department as the U.S. Caliber .30 Carbine, Model M1. David Marshall Williams was hired by the Winchester Repeating Arms Company on July 1, 1939 and assigned to work on firearm design, research and development. Shortly thereafter Williams was assigned the task of working on a rifle prototype initially designed by Jonathan Edmund Browning (half brother of John and Matt Browning). Browning had died before completing the project Williams then inherited. Winchester hoped to submit the rifle as an alternative to what has become known as the M1 Garand. The M1 Garand had already been accepted by the Ordnance Department and production had started, including at Winchester. However, the level of criticism of the Garand design led Winchester to initially believe they should pursue an alternative. The rifle Williams worked on was a main battle rifle in caliber .30-06 and eventually designated the Winchester Model G30. By May 1941 Williams had produced several prototypes of this rifle, the latest weighing only 7 1/2 pounds, while Winchester was realizing the likelihood of replacing the M1 Garand was becoming remote. Testing and evaluation had already begun on a number of submissions to the Ordnance Department's lightweight rifle competition (that led to the U.S. Carbine). Winchester had not entered the competition due to their other commitments, including the main battle rifle being designed by Williams. With the recently completed 7 1/2 lb. Williams prototype main battle rifle and the likelihood it would not replace the Garand, Winchester notified the Ordnance Department they might be able to design and submit a smaller version for the lightweight rifle competition. The challenge was whether or not Winchester could produce a submission in time to meet the Ordnance Dept. deadlines. Winchester assigned several people other than Williams the task of producing a prototype for the lightweight rifle competition, using the design of the larger Williams prototype as a starting point. The first prototype they produced became known as the "Winchester 13 Day Carbine". This first carbine prototype was not a smaller version of the larger Williams design. While a few parts were similar the one thing both firearms shared was the concept of using a short stroke gas piston to operate their semi-automatic actions. Williams had patented this concept (U.S. patent 2,090,656) prior to working for Winchester. The actual design of the short stroke piston Williams used to improve the Browning design was different than the one shown in the patent. Both of these were different than the short stroke gas piston and design used by others at Winchester on their two lightweight rifle prototypes. After the testing of the first prototype by the Ordnance Dept. Winchester formed a team of their designers to correct a number of deficiencies for the second prototype. Williams was initially put in charge of this team but was removed from the team after a couple days when his inability to work with the others, and their inability to work with him, almost immediately ground work to a halt. Winchester had very little time to produce the 2nd prototype. Williams was removed from the team, who continued their work without him. Williams was instead given the opportunity to come up with his own design, working apart from, but concurrent to, the team. The team completed the 2nd prototype with less than 48 hours remaining before the Ordnance Dept. deadline. Several minor problems remained so Winchester requested Williams assist several others in an attempt to work out these problems. Collectively a solution was found and the 2nd prototype was submitted in time and subsequently won the competition. The carbine designed by Williams wasn't completed in time for the trials. The prototype designed by the others at Winchester had already been tested and accepted by the Ordnance Department with limited production having been started by the time Williams finally completed his first prototype.